In late February I took a quick trip to Dayton to visit the National Museum of the USAF. Sadly, I didn't have a chance to cross the field to see the Avro Aerocar, but I did get to tour the main museum. While the collection is stunning, they have decided to display it all in a cave. Actually, that is an insult to caves; they probably have better lighting. Anyway, these are the best pictures I could get...and they are woefully poor. The ex-RCAF Hurricane XII done up as an Eagle Squadron bird. Most online sources say it was RCAF 5390, but I have no idea if that is correct or not. Many of the surviving RCAF Hurricanes have confused IDs. The Australian Beaufighter A19-43 has also been restored in US markings. Really nice to see a restored Beaufighter...but why isn't there one in Canada? This Avro 504K was part of the Imperial Gift to Canada as G-CYEI. It was restored by the RCAF as part of a Centennial Project in 1967 and flew as part of the Old Gold team. Again, now displayed in US markings. The former Confederate Air Force P-82B is now on display in the Korean War Gallery. 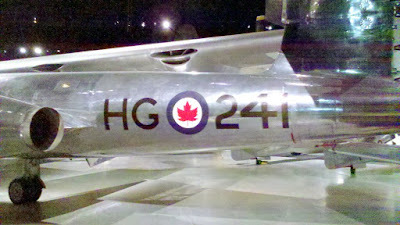 Also in the Korean War Gallery is this nice T-6D Mosquito FAC. An RAF Tornado GR.1 in Gulf War Markings. Watch out for the bad guys...a MiG-29 in this case. Another bad guy...a beautifully restored A6M2 Zero. In need of Rocket Fuel...a German V-2 on its transport trailer. Finally CF-100 Mk.4A RCAF 18241.
low priority item because you're busy with bigger and better things, they'll start to think that maybe you're getting over them and starting to move on. Ten popular Facebook applications have been transmitting users''. Kaplan recently published information about the number of college admissions boards using Facebook and other social network information to review college candidates.